I love Twilight that is my latest confession of the day so when the latest movie came out I was right there! I know that whenever I go to the movies I see women in skimpy dresses and heels. I know that style is not for seeing as in how I'm always cold. 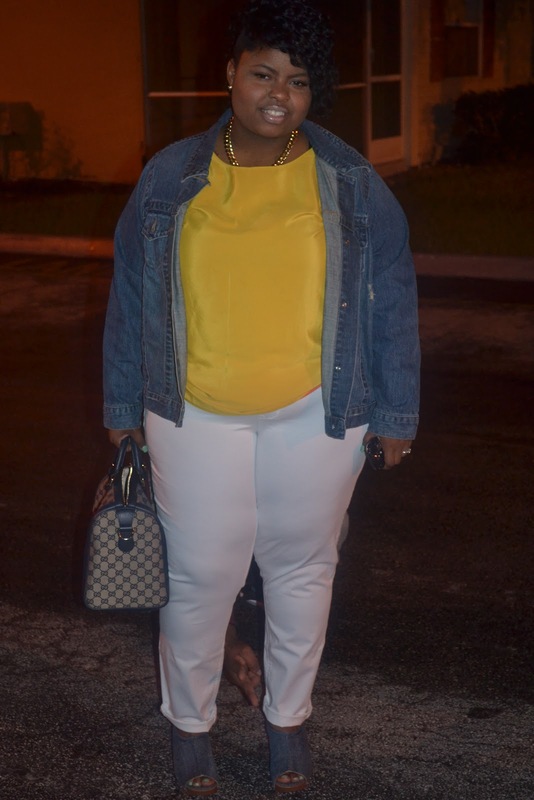 So here's my date night pick this yellow shirt is thrifted for 2 dollars (but there is a secret to that shirt look out for the thrift haul) my pants are American rage for $59 bucks from Macy's they were worth every single dime. The jacket is thrifted from goodwill for $5 dollars and the shoes are Calvin Klein from Ross for $11.99. My bag is Gucci Boston Bag which was recently purchased from Saks for $1,095. Love the outfit! And whoever that is throwing up a piece sign between your legs made me chuckle, lol. My little brother is a menace to say the least lol thank u tho! lol I didn't even see the peace sign!! Haha I'm blind. I love the outfit and I love Twilight too!! MISS YOU SO I THINK I NEED TO HAVE A TWILIGHT DISCUSSION I AM TEAM JACOB ALLL THE WAY!